People are paying more attention to the tragedy of human trafficking. Laws such as the Trafficking Victims Protection Act severely punish perpetrators and support survivors whose cases are being prosecuted. But survivors who choose not to engage with law enforcement need an approach to human trafficking that includes public health measures. This wider approach would support survivors who opt out of law enforcement intervention for fear of retaliation from traffickers, of being criminalized or re-traumatized. Survivors require specialized services to rebuild their lives and re-claim their place in society. As mayor of Houston, I implore our federal and state partners to expand victim services via municipal government. Cities are the governmental entity closest to the people and the most responsive to their needs, and this area is no exception. 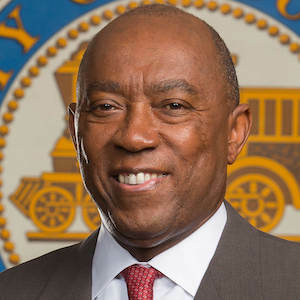 The City of Houston has recognized human trafficking as a public health concern, calling for a systems-based approach to victim services. I encourage mayors of other cities to do the same. That said, human trafficking creates problems unique to each city. Determining those needs is a challenge, which is why I would recommend every major city hire a person who is dedicated to fighting human trafficking. My predecessor appointed Minal Patel Davis as special advisor to the mayor on human trafficking, and I retained her in that position. Davis, an attorney, had previously worked as litigator and a tax consultant for Ernst and Young and was passionate about this issue. Her first task at the city was assessing Houston’s specific needs. With those needs identified, we were able to determine how the city could best move forward. We trained city personnel — health and safety inspectors and other providers of human services — to spot signs of human trafficking during their regular work. Now, when we screen our homeless youth while providing them services, we include questions that can reveal whether they are vulnerable to human trafficking; if they are vulnerable, we immediately connect them to the city’s case managers. To address gaps in victim access to healthcare, especially to mental health professionals, the city secured private funding to hire a human trafficking psychology fellow at Harris Health, the county public healthcare agency. The fellow screens for trafficking and provides outpatient therapy to survivors. The psychology fellow works in tandem with grant-funded mayor’s office human trafficking case managers in hospitals and a shelter collaborative with a national nonprofit. The collaborative provides emergency shelter for survivors identified by healthcare screenings, through municipal referrals and partner agencies’ clients. We also enlist help through a public awareness campaign. Houston Metro placed city-designed signs on every bus, urging people to look for signs of trafficking. After Hurricane Harvey displaced thousands of people vulnerable to trafficking, the City and its volunteer partners went cot to cot in shelters, educating people about trafficker tactics such as false job advertisements, during and after disasters. Municipal purchasing power is another weapon against human trafficking. In 2017, I signed an executive order establishing zero tolerance for human trafficking when vendors and other contractors are doing business with the city, whether it's designing bridges, delivering office supplies or in any other work areas. Zero tolerance means any business found to be complicit in human trafficking is subject to having their contract with the city terminated. The measure pressures city businesses to ensure their subcontractors are complying with labor laws. This year, I co-authored a resolution adopted by the U.S. Conference of Mayors that calls on mayors to seek solutions in addition to punitive or prosecutorial responses for traffickers. As a follow-up, Ms. Davis and Houston Police Chief Art Acevedo made a presentation about these issues at a U.S. Conference of Mayors Leadership Meeting. Prosecution is a powerful, a necessary part of curbing human trafficking. But complete justice includes screening for survivors and vulnerable individuals in the public health system and equipping businesses to address subcontracting or supply chain issues. For example, a prime contractor may have a contractual relationship with a subcontractor and that company can turn around and subcontract with another that is using forced labor to complete a project. Houston is leading the way, and we hope that more cities examine and implement this approach. Sponsor Content: Texas is rural; rural is Texas.